In spite of considerable oil revenues, Chad remains one of the world’s poorest countries, with 80% of its labor force in the agricultural sector. The country’s agricultural potential is underexploited. There are sufficient water resources to irrigate over 5 million hectares of land, weather droughts, and increase agricultural production substantially. With appropriate infrastructure and support, one-third of Chad’s land area could be used to grow crops. Instead, with a highly variable climate, frequent severe droughts and only 7000 hectares of irrigated farmland, agricultural productivity remains low. Overgrazing, deforestation, inappropriate farming practices, and the pressure of increased numbers of people and livestock have caused substantial land degradation. Open access land-use practices threaten the sustainability of forests and pastureland. Clearance of natural vegetation as a short-term strategy for food production has led to rings of desertification and deforestation around population centers. Land-use conflicts between pastoralist and agricultural interests have intensified, adding to migration pressure and undermining social cohesion. The legal framework and institutions governing Chad’s land and other natural resources are inadequate to manage the serious challenges described above. The country’s skeletal land legislation dates from 1967 and does not reach critical issues of land tenure, including the evolution of communal tenure to individualized rights, rights to pasture and range land, and the pressure of a growing population on limited arable land. Chad has no land policy and the government’s efforts to establish basic policy principles appear stalled. As the government recognized when it established a Land Tenure Observatory in 2001, Chad needs a land policy and laws that: take into account aspects of existing customary and Islamic laws; provide guidance on rights to pastureland and natural resources; allow for the formalization of land rights; set standards for the transfer of land; and establish effective, enforceable systems of land dispute resolution. Donors can support the government’s efforts to collect information needed to draft a land policy and necessary land legislation, giving particular attention to the rights to and administration of pastureland, and the rights of herders versus sedentary farmers, which are major sources of continuing conflict. It will be critically important to provide the legislation and basic information in local languages to traditional leaders, local officials, and NGOs working at the grassroots level. The main environmental threats in Chad – desertification and land degradation, deforestation, water scarcity, and loss of biodiversity – result from climatic variability and weak local governance, especially regarding natural resources. A decentralized system will allow for the development of local solutions to issues such as the migratory use of land by herders and the formalization of rights to community and individual land parcels in the southern region. Chad’s lack of strong central governance of land and natural resources, its constitutional call for decentralization of governance systems, and its history of local traditional control create an opportunity for donors to support government efforts to develop effective decentralized land administration and dispute resolution mechanisms and institutions. Twenty-three percent of Chad’s households are headed by women and 54% of these live on less than US $1 a day. Most women lack access to fertile land and live off minor food-processing activities, the sale of firewood, and informal sector jobs. Land and housing in urban areas require rent payments, which women usually cannot afford. Donors can take advantage of the strong culture of women’s organizations in Chad and assist the government in developing land-access programs for women. Assistance with the legal framework will create opportunities to improve women’s land rights by eliminating the provisions that allow discriminatory principles of customary and religious law to trump formal law, and supporting the ongoing efforts to revise Civil Code provisions regarding inheritance and divorce. In addition, donors could assist the government by piloting projects to implement women’s rights through legal literacy campaigns, capacity-building among traditional leaders and local officials, and land and land-based programs targeting women. Chad’s forests are threatened by overuse and misuse. The formal law provides for participatory forest management but Chadian institutions are ill-prepared to implement the law. Donors could assist the government by providing capacity-building and institutional development in the area of forest management, and assisting communities in developing workable models for sustainable forest use. Despite the recent influx of substantial revenues for oil production, Chad remains among the world’s ten poorest countries, ranking 175th of 182 countries on the United Nations 2009 Human Development Index. Fifty-seven percent of Chad’s population lives on less than US $1 per day. More than half the population (95% of women) over age 15 is illiterate. Only 1% of the population has electricity in their homes, and about 33% have potable water. As a result of male migration and death, 23% of households in urban and rural areas are headed by women. Women-headed households are among the poorest families. Agriculture employs 80% of Chad’s labor force. The climate is variable, characterized by frequent severe droughts, and productivity is low. Overgrazing, deforestation, inappropriate farming practices, and the pressure of increased numbers of people and livestock have caused substantial land degradation. Open access land-use practices threaten the sustainability of forests and pasture land. Chadians are clearing the natural vegetation as a short-term strategy for food production, and rings of desertification and deforestation have developed around population centers. Land-use conflicts between pastoralist and agricultural interests have intensified, adding to migration pressure and undermining social cohesion. In urban areas 90% of households live in informal housing that is often erected using substandard materials in areas unsuitable for construction, such as swamps and landfills. Many housing settlements lack sewage facilities, and access to clean water, while improving in coverage to about 50% of the total population in 2008, continues to be limited in urban areas and cholera, typhoid, and meningitis are common. The legal framework and institutions governing Chad’s land and other natural resources are inadequate to manage the challenges facing the country. The country’s skeletal land legislation dates from 1967 and does not reach critical issues of land tenure, including the evolution of communal tenure to individualized rights, rights to pasture and range land, and the pressure of a growing population on limited arable land. Chad has no land policy and the government’s efforts to establish basic policy principles appear stalled (CILSS 2003). Chad’s mineral sector is dominated by oil, which in 2008 was responsible for 80% of government revenue. The government’s failure to adhere to agreements regarding the use of oil revenues for poverty alleviation (a condition of the World Bank’s loan for the construction of the Chad-Cameroon Pipeline project) led to the partial closure of the Bank’s office in Chad in 2008 and a suspension of many of the Bank’s programs. The government is finding new investors to explore and exploit oil fields not currently under production. Chad is the fifth largest African country, with a total land area of 1,259,000 square kilometers. 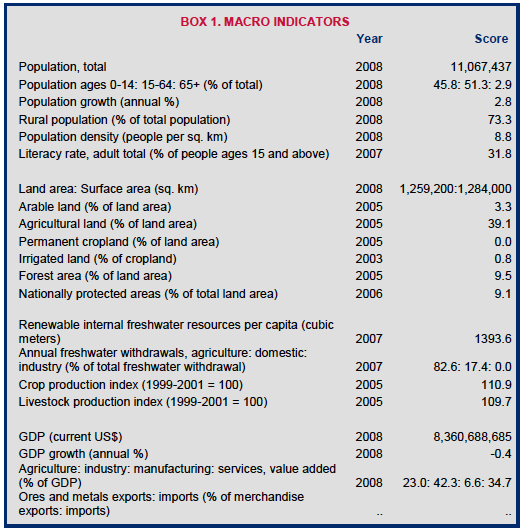 In 2008, the country had 11 million people, with 73% living in rural areas and 27% in urban areas. The majority of the population is concentrated in the agricultural areas in the south. Total GDP was US $8.4 billion in 2008, with 42% attributed to industry (mainly the petroleum sector), 35% to services, and 23% to agriculture (World Bank 2009a; World Bank 2006; World Bank 2003). The country is divided into three distinct zones: (1) the southern Soudan, which is ecologically part of the wet Congo basin and contains half the country’s cultivated land (10.2% of the total land, 47% of the population); (2) the dry Sahel-Sudanian zone in central Chad where the main activities are cattle-herding and cultivation of cereals (43.1% of the land, 40% of population); and (3) the semi-desert and desert Saharan zone in the north (46.7% of the land, 13% of the population) where the main income-generating activities are date-cultivation, camel-herding, and transport (ADF 2004; World Bank 1997; GEF 2004; UN 1997). Thirty-nine percent of Chad’s total land area is devoted to agriculture, with at least 80% dedicated to food crops. Cash crops account for the remainder, with cotton the main cash crop. Roughly 0.8% of cropland is irrigated. In 2005, forests made up 9.5% of total land area; the deforestation rate was 0.7% in the 2000–2005 period. Chad has classified 9% of its total land as nationally- protected areas (World Bank 2009a; GEF 2004). Livestock is the largest agricultural asset, and people often maintain livestock as a store of wealth rather than a source of ready cash. Stock-breeding accounts for roughly 32% of agricultural GDP, employs 40% of the national population, and engages 80% of the rural population (ADF 2004; World Bank 1997). Continuous cropping, poor land- husbandry practices, and wind and soil erosion are degrading Chad’s land and depleting the soil’s native fertility. Crop yields are declining. Prolonged drought has dried up water courses and reduced the amount of quality pastureland. Herders and sedentary farmers compete for land and access to water and put increasing pressure on forest resources (Odada et al. 2006; GEF 2004). Chad has a population of more than 200 ethnic groups with livelihoods based in large measure on geography. Roughly 53% of the population is Muslim. The northern section of the country is desert, suitable for herding and populated primarily by a nomadic and semi-nomadic Muslim population that relies on livestock for its livelihood. The main tribes in the northern and central regions of the country are the Gorane, Zaghawa, Kanembou, Ouaddai, Arabs, Baguirmi, Hadjerai, Fulbe, Kotoko, Hausa, Boulala, and Maba. About 47% of Chad’s population, most of whom belong to the to the Sara, Moudang, Moussei, and Massa tribes, are Christian or animist and live in the southern portion of the country. The southern population primarily relies on sedentary subsistence farming, although urban areas and the attendant informal urban economy are expanding (World Bank 2003; USDOS 2010). In the southern agricultural zone, increases in population density and commercial farming coupled with low access to agricultural inputs is creating a class of landless producers who rent in land or work as agricultural laborers. Forty percent of the farmers in Chad cultivate 20% of the land, while the top 20% of farmers cultivate 40% of the land (World Bank 2003). At the end of 2009, about 253,000 Sudanese refugees were living in Chad in 12 camps situated along Chad’s eastern border, and there were 168,000 IDPs in eastern Chad. Chad also has about 68,000 refugees from violence in the Central African Republic (USAID/DCHA 2010; AI 2008). Fifty-seven percent of Chad’s population lives on less than US $1 per day. Only 1% of the population has electricity in their homes, and about 33% have potable water. The country ranked 175th of 182 countries on the United Nations 2009 Human Development Index (UNDP 2010; World Bank 2003; ADF 2004). Chad adopted its most recent Constitution in 1996 and amended it in 2005. The Constitution and formal law recognize the existence of customary and religious law but prohibit customs and practices that discriminate among citizens. The Constitution provides for decentralization in order to create a more equitable and democratic distribution of power down to local levels (ROC 2005; World Bank 2003; CILSS 2003). Chad’s formal land legislation is contained in three laws: Laws Nos. 23, 24, and 25 of 22 July 1967. The laws reflect principles of freehold tenure introduced by colonialists, require landholders to register ownership rights, and provide for the expropriation of land by the state. Two recent efforts to make the formal law relevant to the present day are: Law No. 7 of 5 June 2002, which empowers rural communities in natural resource management and environmental protection; and Decree No. 215 of 24 April 2001, which established a National Land Observatory to improve understanding of land-related problems in order to support the development of effective land-related policies and legislation (Furth 1996; CILSS 2003). In most cases, Chad’s formal land laws have not been translated into local languages (or English) and texts of the laws are not disseminated. The general population, grassroots organizations, and many officials and leaders are unfamiliar with the content of the formal land laws. Customary and Islamic laws govern issues regarding access to and control of land and natural resources in urban and rural areas (CILSS 2003; World Bank 1997; Furth 1996). Formal law (including Islamic law) and customary law recognize public and private land rights in Chad. Under its legislative framework, the state holds all public and private land, as described below (World Bank 1997; ADF 2004). Public property. Under formal law, the state holds two types of public property: Natural Public Property (e.g., lakes, streams, minerals, classified forests); and Artificial Public Property (e.g., irrigation channels, airports, public utilities, monuments, waterways). The state cannot alienate public property but can grant rights of occupation under a contract or subject to a permit. Islamic and customary laws classify certain land as held by the imam (religious leader) or traditional leaders at village and canton (district) levels for the benefit of all people (World Bank 1999; Furth 1996; ADF 2004). Private property: Formal law classifies all vacant or virgin land as state land. Any state land that is not within the definition of public property is considered under Chad’s legal framework to be the private property of the state, which individuals can acquire. Private state land includes vacant and unregistered land, abandoned land, and land that is unusable. Customary law recognizes ndouba, which is community-owned village land (including surrounding lands, and, often, former village sites). Formal, Islamic, and customary laws also recognize the rights of individuals and entities to hold property to the exclusion of others (World Bank 1999). Ownership. Islamic law, which governs in the central and northern regions of the country, recognizes collective and individual ownership of land. Private lands are subject to individual control while collective land is governed by the imam (religious leader) on behalf of all Islamic people, and individuals can obtain usufruct rights. Chad’s formal law recognizes private freehold rights, including the right to occupy and use land, exclude others from the land, and transfer it freely (Furth 1996; ADF 2004). Leasehold. The formal land law recognizes rights to lease land. The prevalence of formal leasing is unknown. As customary tenure has evolved to become more individualized, a lease market is emerging. Rural residents rent in agricultural land when they are able to farm more than their holding. Landless households and women access land through short-term use agreements with neighbors or within their kinship system (Koultchoumi 2008; Furth 1996). Occupancy rights. Traditionally, most of the population only had occupancy rights to land, with religious and traditional leaders holding ultimate rights in trust for their communities. While the customary system has begun to evolve into more individualized tenure in parts of the country, the role of the traditional leader as a type of trustee for communities and community members’ use-rights continue to inform the understanding of land tenure in areas where customary tenure dominates (Furth 1996; ADF 2004). Exploited bush. Under customary law, land that a community has used is considered exploited bush. If a village moves, it retains residual rights to the land. If a village dies out, the land reverts to the canton-wide (district-wide) land pool (World Bank 1999). While customary systems of land access vary widely across the country, most Chadians traditionally obtained land through their kinship group or lineage, through application of the principle of ―first occupant, and, for women, through marriage. In the southern half of the country, populated by the Sara tribe, land is collectively owned under a patrilineal lineage-based tenure system, beginning with the individual who first cleared the land. The occupant receives inalienable use-rights to the cleared land, conditioned upon payment of an annual or seasonal fee to the traditional authority. When the occupant dies or can no longer use the land, the land transfers laterally through the eldest male in the lineage, the land chief, who reallocates the land to others who are landless or have an inadequate allocation (World Bank 1997). More recently, this customary system is evolving into a family-based inheritance system. As land becomes scarcer, families are unwilling to give up their land to the lineage. Within the customary system, land has become increasingly individualized under family names and passed to male descendents. In some areas, land is transferred within the informal system as a commodity, both within and outside the kinship group. In other areas, landless households and women access land through short-term use agreements with neighbors or within their kinship system (Koultchoumi 2008; World Bank 1999; Furth 1996; World Bank 1997). Under formal law, individuals and entities can obtain private ownership of state-held private land and land owned by private parties, through land grants, concessions, and land purchases. The land laws require land purchasers to register the land with the Land Registry and obtain a titre foncier, a land title. Development projects often include land distribution programs. Persons agreeing to develop the land with specific infrastructure (such as irrigation), comply with a recommended farming schedule, and pay fees are eligible to receive the land allotments (World Bank 1999; World Bank 1997; ADF 2004). Under Chadian Law No. 23 of 22 July 1967, if a landholder does not use his or her land for ten years, he or she loses the right to it. Law No. 24 of 22 July 1967 provides that if land is not titled and no rights are registered, the land is state land. This requirement trumps provisions that recognize customary land tenure systems. Registering a property transaction in Chad requires six procedures, an average of 44 days, and payment of 23% of the property value (World Bank 2008; ADF 2004). The registration mandate has had little impact. As of the mid-1990s, roughly 2000 land titles had been registered in the entire country; less than 15 titles were issued to rural land users. The lack of compliance with the formal law likely does not reflect a sense of tenure security by those with customary land claims. Rather, landholders are most likely not registering their rights because they are unaware of the requirement, the formal law lacks social legitimacy, landholders do not have the financial resources to pay registration fees, and government institutions responsible for surveying and registration lack capacity (Furth 1996). Most land is held in the name of the male head of household. Most customary systems do not consider wives as landholders. The extent of registration of women’s land rights under the formal system is unknown (Furth 1996). Women’s rights are governed by the Constitution, the 1958 Civil Code, and Islamic and customary law. The formal land laws (Laws No. 23/24/25 of 22 July 1967) recognize the right of any citizen to own land. In practice, however, women in many parts of Chad have limited rights to land, especially to fertile or irrigated land. Ninety-five percent of women in Chad are illiterate, and few have knowledge of their legal rights. As a result of male migration and death, 23% of households in urban and rural areas are headed by women. Women-headed households are among the poorest families (ADF 2004; ROC 2003; World Bank 2003). The Constitution provides that traditional laws regarding inheritance and marriage can only be applied with the consent of the parties. If there is no contract to the contrary between the parties, the principle of joint marital property applies. The Civil Code allows women to inherit land. Despite these provisions, few women have any property rights. Efforts to update the Civil Code to provide greater rights to women have been defeated to date (ROC 2003; World Bank 1997; ROC 1958). Under Islamic law, daughters have the right to inherit property at one-half the share of sons, although daughters usually surrender their inheritance rights to their brothers. A widow’s share varies, but in most locales a widow’s rights are precarious unless she has sons (World Bank 1997; COHRE 2006). Women obtain access to land through their fathers, husbands, and male relatives. Fathers may give their daughters rights to cultivate a portion of the family land until the time the daughters marry. Single women rely on the men in their extended families for land access. Most women obtain access to land through their husbands; the majority work on their husbands’ land and in some areas may have near total control over the crops and cultivation (Koultchoumi 2008). In areas where customary land has become individualized, a husband may give his wife a portion of land in ownership, especially after they have been married for a number of years and she is considered an elder in the community. If a woman’s husband dies, she will take control of his land. In some regions, she will be considered the new owner of the land; in other areas she will have control of the land until her sons reach majority. Women also may obtain access to land through a church or cooperative or through leases with neighbors and community members (Koultchoumi 2008). Women’s land rights tend to be obtained through their spouses and may be lost in the event of death or divorce. However, in some areas women are increasingly accessing land by establishing rental agreements with neighbors or obtaining their own land from churches and cooperatives; their land rights are more dependent on their own efforts and less on their relationship to their husbands. As part of a Participatory Communication Project implemented by the Permanent Interstate Committee for Drought Control in the Sahel (Comite Permanent Inter-Etats de Lutte Contre la Secheresse dans le Sahel, CILSS), women in the Lake Chad area who had been traditionally excluded from land ownership organized themselves into female associations and acquired plots to cultivate (Koultchoumi 2008; CILSS 2003). The Ministry of Land Management, Urbanism and Habitat (Ministère de l’Aménagement du Territoire, de l’Urbanisme et de l’Habitat, MATUH), through the Director of Urban Cadastre and Cartography (Direction de l’urbanisme du cadastre et de la cartographie, DUCC) is responsible for surveying and registering land. Little information about the Ministry’s functioning is available, but it reportedly has extremely limited capacity, conducts no land surveys, and its registration activities are very limited, with fewer than 2000 titles issued country-wide (Furth 1996). Rural development management is managed by four different bodies: the Ministry of Agriculture (MINAGRI), the Ministry of Livestock (ME), the Ministry of Environment and Fisheries, and the Ministry of Water . These ministries are responsible for designing, implementing and monitoring rural development projects and programs (ADF 2004). In practice, while no formal framework exists for the decentralized governance of land, traditional authorities govern land at the village and canton levels. A canton chief exercises administrative control over the canton land and acts as liaison between the government and residents of the canton. The land chief historically controlled villages’ inhabited, cultivated, and fallow land, including exploited bush. As land rights has become more individualized, the role of the chiefs has evolved. In some areas, chiefs continue to be engaged in land allocations and transactions, often benefiting financially from their authority. In other areas the chiefs’ authority may be diminished (Koultchoumi 2008; World Bank 2005; World Bank 1999). Traditionally, most land held under customary tenure could not be sold; land was considered to be held by the lineage rather than as individual property. Land is increasingly considered a commodity and an informal land market is emerging. In some areas, the roles of chiefs and sultans have evolved from custodians of the land to asserted landowners and agents. Residents must now pay the traditional leaders for land that used to be available at no cost or upon payment of a nominal sum or gift (Koultchoumi 2008; Furth 1996). Good-quality arable land has become increasingly scarce and the traditional right to inherit land is no longer assured. A land-sale and rental market is active in many areas and prices are increasing. If or how the land transactions are recorded in urban and rural areas is unknown; few (if any) transactions are recorded with the Ministry of Land Management, Urbanism and Habitat (MATUH) (Koultchoumi 2008; Furth 1996). The Constitution of Chad provides that private property is inviolable and sacred; no one shall be dispossessed of property unless for reasons of duly established public utility and with payment of just and predetermined compensation. Law No. 25 of 22 July 1967 states that the Chadian government has the right to expropriate land under customary ownership or use, or rural land that is undeveloped and deemed abandoned, if expropriation is in the public interest and for reasons of public utility. The law provides that compensation for the taking shall be mutually agreed between the parties; if agreement cannot be reached, the parties shall take the matter to the local court for judicial determination. The government must give all those with interests in the land at least 30 days’ notice of eviction (ROC 1996; ROC 1967). Beginning in 2000 the government acquired a substantial amount of land for development of the Chad-Cameroon Oil Pipeline. As of 2007, the project had acquired a total of about 7100 hectares for the length of the project (from Kome, Chad to Kribi, Cameroon), and paid about US $8.25 million to landholders and communities – either in cash or in kind – for losses sustained from loss of use of the land (lost labor, lost crop opportunities) that was acquired for the pipeline project. In Chad, the project paid an additional US $1 million to compensate 61 villages in the oil field area that sustained negative impacts, and is rehabilitating and returning some of the land required for initial project development to the local communities. Despite these efforts, monitoring reports from villages affected by the pipeline reported local dissatisfaction with how the project determined compensation for land and trees; the failure to compensate for environmental impacts; failure to meet obligations of capacity-building for the local community (especially training for skilled jobs); and the project’s lack of transparency and communication regarding issues of compensation (ROC 1967; Barkley and Koppert 2007; Djiraibe et al. 2002; Esso 2008). Access to scarce natural resources has generated fierce competition and conflict in Chad. Successive and prolonged periods of drought have caused livestock production to shift from the north into sedentary farming areas of the south, causing conflict between the groups. Herders heading south early in the year damage unharvested crops, and trample newly-seeded land at the beginning of the rainy season as they return north. Farmers with bore-wells risk being overrun by livestock. The groups fight for control of wild plantations of gum arabic, which herders have traditionally used for generations and local sedentary groups have recently discovered are valuable (World Bank 2003; ADF 2004; AUC 2008). The tenuousness of land tenure security became evident in a number of land conflicts erupting from the Chad-Cameroon Oil and Pipeline project. Identification of the route (the basis for compensation payments) led to multiple claims for the same land. As the project progressed, disputes erupted over how individuals were selected for compensation and how compensation was calculated (Djiraibe et al. 2002). Chad’s formal court system reflects the 1967 merger of civil and Islamic systems, but little is reported about the courts’ capacity, accessibility, jurisdiction over land matters, or the enforceability of judgments. Land disputes between rural users are often settled at the local level by traditional leaders who apply customary law and use traditional conciliatory methods of dispute resolution. Traditional leaders will often refer large, unresolved cases to the formal court system (AUC 2008). In the Soudan region, secular village leaders rather than the land chief are increasingly used to mediate and resolve land disputes and allocate land – an evolution that may reflect the desire to move from the lineage land system to a more individualized system. The transition is far from complete, and it is often unclear which leader has primary responsibility for land. However, local efforts at land dispute resolution have been rewarded: in a conflict-ridden area north of Lake Chad, communities entered into 109 separate agreements with nomads and semi-nomadic people regarding seasonal grazing and water access – reducing the number of disputes to almost zero (World Bank 1997; AUC 2008; SPORE 1998). In 2001 the government formulated a rural development intervention program that included support for diversifying agricultural production, promoting farmers’ organizations, and building capacity in agricultural-sector institutions. The government prepared a Rural Development Intervention Plan (PIDR) in 2000. The Plan’s primary development objective is a sustainable increase in agricultural production, in combination with environmental conservation and rural capacity-building. The government also prepared a Master Plan for Agriculture (MPA) for implementation over a 10-year period (2006–2015). The MPA’s objectives are (1) food security; (2) increased incomes and employment, particularly in rural areas; (3) increased economic growth and higher volumes of foreign exchange entering the country; (4) a sustainable improvement in rural living standards and quality of life; and (5) strengthened regional integration for Chad in the area of trade. The country also has a National Programme of Action to Combat Desertification (PAN/LCD), which sets out a framework of measures to assist people and local organizations in securing a sustainable improvement in dryland management. The programme identifies factors contributing to desertification and concrete measures to combat it and to mitigate the effects of drought (IFAD 2009). The government established the National Land Observatory in 2001 to build a foundation for development of a land policy. The observatory is built around a cluster of institutions presided over by the Prime Minister and the principal operator, the University of N’djamena. The objective is to improve knowledge and understanding of land-related problems to support the development of relevant land policies and legislation. No results of the Observatory have been reported (AUC 2008). USAID supports Chad through its West Africa Regional Mission, based in Ghana. USAID’s programs continue to recognize the effect of conflict, displacement, and limited resources in Chad, and prioritize humanitarian assistance targeting vulnerable groups, especially in the eastern region bordering Sudan’s Darfur region. During FY09 and FY10, the United States Government provided more than US $213 million in humanitarian assistance to IDPs, refugees, and host communities in Chad. The assistance included agricultural and food security interventions. The Eastern Chad Horticulture Program (2006–2009), which was funded by USAID/Office of Foreign Disaster Assistance, was implemented by Catholic Relief Services and the local group, Secours Catholique et Development (SECADEV). The program provided agricultural support to displaced populations in 45 villages through the provision of seeds, equipment, and technical assistance. USAID also funded World Concern’s Self-Reliance in Eastern Chad Program in FY09, which included agricultural support for IDPs through seed and rain retention programs. In its FY10 budget request, USAID included US $3 million for agriculture interventions focused on increasing productivity (USAID 2010; USAID/DCHA 2010; USDOS 2009;WCDO 2010; CRS 2009). The World Bank has provided support to Chad for years, including funding a poverty-reduction strategy that supports good governance, legal and judicial reform, investment in human capital, improvement in living conditions for vulnerable groups, and rehabilitation and protection of ecosystems. The Bank provided support for the Chad-Cameroon pipeline and development of a framework for the use of oil revenue to support social programs such as health, education, and rural development. In February 2008, the World Bank closed its office following rebel attacks in the capital, and continuing disagreements with the Government of Chad over the use of oil revenues. After negotiations between the government and the Bank, the Bank reopened its office on a reduced basis in order to supervise its existing portfolio. The parties agreed that any new operations will focus on improvement of the impact of oil revenues on poverty alleviation, in support of the Government’s implementation of its poverty-reduction strategy. A new strategy for Bank engagement in the July 2010–June 2012 period will be presented to the World Bank Board of Directors in June 2010. The strategy proposes two main areas of engagement: (1) support to improve governance and public financial management; and (2) support to sectors that will have a direct impact on poverty reduction (World Bank 2010; World Bank 2009b; World Bank 2006; ADF 2004). The US $94 million World Bank-funded Local Development Program Support Project (PROADEL) (2005–2011) was created to assist the government in designing and implementing a decentralized and participatory financing mechanism to empower local communities and decentralized authorities to manage development funds. The project includes support to improve the land tenure system in Chad by: (1) creating a database on land tenure; (2) defining new research programs on land tenure; (3) collecting data; and (4) strengthening the capacity of the National Land Tenure Observatory. The project was suspended in 2008 (World Bank 2009b; World Bank 2006). In 2004, The African Development Fund (ADF) began a 6-year US $20 million project focused on the sustainability, diversification, and increase of the productivity of natural resources in the Sudan region through irrigation schemes, the production and utilization of selected seeds, introduction of more adapted new technologies, and restoration, improvement and conservation of soil. Project activities include the development of village committees, improved cultivation techniques, and rehabilitation of agricultural land and reforestation. The International Institute for Environment and Development (IIED) and SOS Sahel UK managed a one-year project in 2008 focused on protecting and promoting livestock mobility and securing pastoralism in dryland areas of Chad and seven other countries. The International Fund for Agricultural Development (IFAD) supports activities promoting food security and microfinance, and the specialized agencies of the United Nations (FAO, United Nations Development Programme, and the World Food Programme) are involved in capacity-building and food security (ADF 2004; IIED 2007). NGOs are among the most active forces of development in Chad and intervene in areas where the state has been unsuccessful because it lacks capacity or because a local approach is required. The most active NGOs are the Study and Liaison Office for Charity Development Action (BELACD), the Christian Centre for Support of Community Development (CECADEC), CARE, and World Vision. None of the groups focuses solely on land, although all are involved in the development of local institutions and issues relating to the management of natural resources (ADF 2004). Chad has significant permanent and semi-permanent waterways, groundwater, and surface water. Lake Chad, located at the western corner of the country and shared by Cameroon, is a large shallow water body fed by the Chari River. A drier climate and the use of substantial volumes of the lake’s water for irrigation projects have caused it to shrink: the lake’s surface area was about 25,000 square kilometers in the 1960s and reached into Niger and Nigeria; it is currently about one-twentieth that size (Solocomhouse 2009). Almost three-quarters of Chad has sedimentary basins with several layers of groundwater. The volume of subterranean water ranges between 263 and 455 billion cubic meters per year, with a replacement volume of 20.6 billion cubic meters. Experts believe that Chad, unlike other Sahelian countries, has sufficient groundwater to increase agricultural production substantially, and the ability to weather droughts. Only 7000 hectares of farmland in Chad is irrigated, and Chad has sufficient water resources to irrigate roughly 5.6 million hectares of land. The government estimates that with appropriate infrastructure and support, one-third of Chad’s land area (39 million hectares) could be used to grow crops (ADF 2004; ROC 2003; FAO 2009; FAO 2005a). Chad’s main irrigation areas are located in the Soudan region and were created between 1950 and 1974. The irrigation system faces technical challenges in areas of water-management, and maintenance of irrigation facilities, dams, and dykes is insufficient. Some of the protective dykes have deteriorated, leaving villages vulnerable to uncontrolled floodwaters (ADF 2004). In Chad’s urban areas, the vast majority of the residents (90% in some cities) live in informal settlements. Most of the informal settlements lack clean water and sewage facilities, and diseases such as cholera, typhoid, and meningitis are chronic. Access to safe drinking water is improving, however: between 1990 and 2008, the percentage of Chad’s population improved from 38% to about 50% (ROC 2003; World Bank 1997; ADF 2004; UNICEF 2010). The Water Code of 1999 sets out the management of water resources and water access for stock-breeding, agriculture, and human consumption. Under the Water Code, all naturally-occurring surface and subsurface water is considered to be in the public domain. Water rights are generally included in and transferred along with land rights (ROC 1999; ADF 2004). Under Islamic and customary law, all people have rights of access to water sources. Use-rights to water depend on the source: private parties and first clearers of land have rights to the water source on the land and may construct wells on their property. Islamic law allows the inheritance of rights to water sources such as springs, but water rights cannot be loaned, rented, or sold. The children of the first wife of a spring-owner obtain ownership rights; the children of other wives have only use-rights (Furth 1996). Under formal law (including Islamic law) and customary law, rivers and lakes are open-access resources. The Water Code provides that the state may restrict access to and use of public water resources as necessary to preserve and protect the resource and the rights of all users. Users of public water resources are obliged to use the water efficiently and economically, protect the environment, and avoid interfering with the rights of others. Landholders have the right to use rainwater falling on their land, and the right to access groundwater. Application must be made to local authorities to change the course of a natural stream or river, and those with upstream access to river water are prohibited from interfering with downstream rights (ROC 1999; Furth 1996). Under formal and customary law, ownership of land includes use and control of any developed water resources. However, anyone establishing a well must allow others access, including to water livestock. Well-owners may charge a fee for such access and may limit livestock use to two or three days (ROC 1999; Furth 1996). The Ministry of Water (formerly the Ministry of Environment and Water Resources) is responsible for developing and implementing national environmental and water policy. The Ministry of Agriculture is responsible for the irrigation system, and the Department of Rural Engineering and Irrigation is responsible for the design, coordination, and implementation of irrigation policy. Local traditional leaders are largely responsible for ensuring that water resources are used according to customary and Islamic law, as applicable. Chad is a member of the Lake Chad Basin Commission, which regulates and controls the utilization of water in the basin by member countries (Chad, Cameroon, Niger, Nigeria, Sudan, and the Central African Republic) (Odada 2006). The Ministry of Water has lacked financial resources and a sufficient base of technical and environmental knowledge from which to operate. Capacity within the local government and among traditional authorities regarding water management has been low. Inadequate management of resources in the Lake Chad basin has led to conflicts over water-use between upstream and downstream communities (Odada 2006; World Bank 2005). In 2003, Chad adopted a Master Plan for Water and Sanitation (2003–2020) following recommendations from the United Nations on the integrated management of water resources and expansion of access to water in urban and rural areas. The Plan presents the government’s policy, strategy and action plan for the water sector, with a goal of achieving plan objectives by 2015. The strategy includes components for potable water, pastoral and agricultural water, water resources and sanitation. The Plan provides an organizational framework for water governance and national capacity-building. In the area of pastoral water, the Plan calls for securing transhumance throughout the country and the rational development of pastoral land (ROC 2003; IFAD 2009). With a US $56 million loan from the World Bank, the government of Chad undertook the Critical Electricity and Water Services Rehabilitation Project (CEWSRP) (2002–2007), which was designed to provide basic water and electricity in N’Djamena and in 6 to 8 smaller urban centers, and to reduce service costs through increased private sector participation in both sectors. The project included a component designed to improve the technical, commercial, and environmental performance of the Water and Electricity Corporation of Chad (Societe Tchadienne d’Eau et d’Electricite (STEE). No project evaluation documents have been made public to date (World Bank 2002). USAID’s program for economic growth assistance in Chad has focused on the eastern sector and IDP populations. The agency’s humanitarian assistance has included projects concerning access to water and the provision of safe water (USAID 2008). The International Fund for Agricultural Development (IFAD)’s US $39 million Pastoral Water and Resource Management Project in Sahelian Areas (PROHYPA) is designed to secure transhumance systems by establishing water points and marking transhumance corridors in the central and western parts of Chad. The project will promote and support organizations that plan and manage water points and transhumance corridors. The project will improve capacity to handle water-management disputes, including use of traditional authorities and local conventions that bring stakeholders together to form natural resource management plans. Water needs for household use will be covered by the pastoral water project and by village water-supply partnerships with the European Union (EU), the French Development Agency (AFD) and the African Development Bank (ADB) (IFAD 2009). The Global Environmental Facility (GEF) began implementation of a World Bank-funded US $70 million Integrated Ecosystem Management project (2005–2009) through Chad’s Ministry of Water and the Environment. The project included a bottom-up plan for implementation of the country’s National Environmental Action Plan, which includes addressing weaknesses in the legal framework governing natural resources management, including water. The program section with GEF resources includes capacity-building within the Ministry of Environment and Water. The program was suspended in 2008 (GEF 2004; World Bank 2006; World Bank 2009b). Forests cover roughly a quarter of Chad’s land area and are mostly located in the southern Soudan region. Chad has about 593,000 hectares of classified forests, and about 15,000 hectares that have been reforested. As of January 2010, the country had roughly 1.4 million hectares of national parkland (Zakouma, Manda, Aout, and Goz Beida national parks, with another opening in June 2010), seven wildlife reserves, and one biosphere reserve. Chad’s wildlife includes elephant, derby elk, kudu, oryx, addax and the maned sheep. The gum and shea- butter trees are the main forest species of economic interest (ADF 2004; Protected Planet 2010). High population density and pressure on resources have caused significant forest degradation throughout the country’s forests, yielding an estimated 0.6% annual deforestation rate. Other causes of degradation are gully erosion and poor farming practices used in cotton and cassava cultivation. Population displacements have resulted in illegal clearing of forest land for crops, unauthorized tree-cutting, and overgrazing grassland areas. The government has been trying to combat desertification and provide for the population’s energy needs by enforcing a ban on charcoal production and cutting live trees for fuel in the capital. The government has also engaged in soil conservation, greenbelt construction, and construction of plantations (IRIN 2010; FAO 2006; ADF 2004). The population’s need for fuelwood can be especially critical around refugee camps in eastern Chad. Women and children are responsible for finding wood and often travel long distances to find sources of wood, which causes them to be vulnerable to violent attack (Hartill 2009; UNICEF 2006). Chad’s Law No. 36 of 1994 specifies that forests on public land belong to the state, and mandates forest conservation measures. The law regulates timber harvesting, transport and marketing at the national level, requires monitoring of national forests and environment policy, and calls for the design and preparation of strategies to combat desertification (World Bank 1997; FAO 2007; Amsallem et al. 2002). By implication, forests on private land are subject to the terms and conditions of the private land rights. However, people planting trees on fallow land cannot obtain tree tenure. The law states that forests in the state’s domain may, under conditions and procedures defined by decree, be leased in concession for the benefit of a local authority, rural or village community, or national enterprise. All forest harvesting operations must be preceded by an inventory and are subject to a list of specifications regarding the technical conditions for exploitation of the products involved. The area allocated to a single lease may not exceed 50,000 hectares. 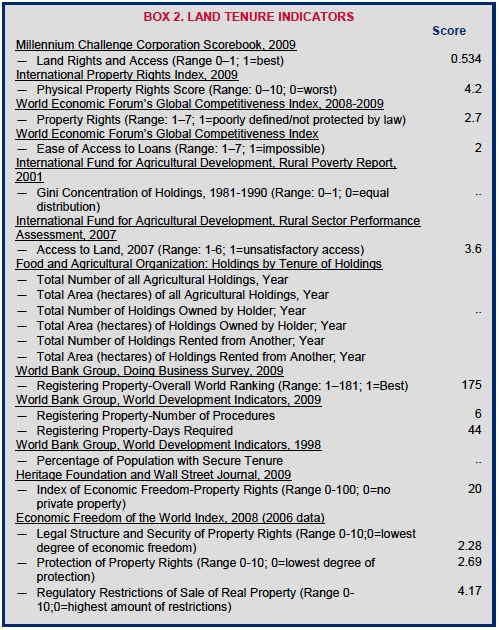 (World Bank 1997; FAO 2007; Amsallem et al. 2002). Chad followed the 1994 law with Law No. 14 of 1998, which provides for a balanced, rational forest management policy that permits economic use of forest resources and upholds general principles for environmental protection. Management, development and exploitation plans must recognize environmental concerns so as to ensure that the forests’ protective functions are reconciled with economic, social, cultural and recreational uses. The legal framework provides that landowners who plant trees are owners of those trees, yet they are also required to work with the government to ensure sustainability of forests and combat environmental degradation. The owners of private forests may be required to obtain a license for activities such as felling trees. In 1999, Chad adopted a Forest Code establishing principles of sustainability and participatory management in the forest sector (World Bank 1997; FAO 2007; Amsallem et al. 2002). Chad’s Law No. 14 of 2008 governs the country’s forest, wildlife and fisheries resources. Law No. 14 provides for the division of public forests into areas managed by central and local authorities. The law also provides for the management of certain forest resources by local communities. The law’s provisions are quite general and, to date, no regulations have been enacted. Commentators note that the law has not been implemented due to a lack of capacity within the government and local communities (FAO 2010). Under the Forest Code, the state owns the country’s public forestland and trees. Private land owners are the owners of trees planted on their land. The state can grant concessions of forest land for the benefit of a community, local authority, or national enterprise. The Code permits individuals and communities to obtain rights to land that they have reforested or regenerated. Access to protected areas and use of forest products from protected areas is restricted (ROC 1994; FAO 2006). The Directorate of Forest Protection falls under the Ministry of Environment and Fisheries. The Directorate is responsible for maintaining the forests and the protection of classified forests. The Directorate’s forest service staff is limited in number and lacks capacity. In general, the Directorate staff members are less familiar with participatory approaches to forest management; as a result the provisions of the Forest Code vesting certain rights in communities have not been widely implemented. The Centre for Applied Research, founded in 1987 and now known as the Research Support Centre, is responsible for providing forest research support upon ministerial request (FAO 2005b; FAO 2006; FAO 2010). Chad supported participatory forest management in the period from 1989 to 1997, including the formation of village forest-management associations and the restocking of depleted forests in pilot areas. The Directorate of Forest Protection considers the initial effort, a UNDP program for the 1980s focused on the 30,000- hectare Morgoum Forest south of N’Djamena, to have been ultimately unsuccessful: when the project concluded, local communities encroached on forestland, and the forests were subject to overgrazing and poaching of wildlife. The second (and last reported) effort at participatory forest management ran for 6 years (1991–1997) in the same forest area. The project was funded by the Netherlands and executed by FAO. The Directorate reports that the project established 15 village groups in 7 villages and succeeded in sustainably protecting 30,000 hectares of forest and restocking over 5000 hectares. The Directorate attributes the success of the program to new approaches, including engagement with chiefs, awareness-building among stakeholders, and training for local communities (FAO 2006; Djekourbian 2003). In an effort to combat desertification, in 2009 the government began enforcing a ban on the production of charcoal and cutting of live trees for fuel in N’djamena. Police were dispatched to the entry points to the city where they seized trucks carrying fuelwood and charcoal into the city. Within several weeks, charcoal and fuelwood were unavailable in the capital. It is unknown whether the government has continued to enforce the ban, the impact of the ban on the country’s trees, or the extent to which residents adapted to using alternative fuel sources (IRIN 2009). The World Bank-funded US $7.5 million Household Energy Project, 1998–2004, created local village groups that developed and executed land-use and wood exploitation plans to manage and control fuelwood use and generate sustainable income from a woodfuel tax and sale of woodfuels. The project successfully created a village-based natural resource management system (which served as a model for the larger PROADEL project) and developed local capacity to monitor and control wood use. The project was not successful at improving the efficiency of household fuel-use due to the difficulty of accessing raw materials for the construction of stoves, lack of kerosene, and government performance (World Bank 2004; World Bank 2005; Tomaszewiczs 2010). Chad’s mineral sector is dominated by hydrocarbons. The development of the Chad-Cameroon pipeline was one of the largest construction projects in Sub-Saharan Africa. The project was managed by a consortium of oil companies and included potential development of 300– 600 oil wells and supporting infrastructure in the Doba region of southern Chad, a 1050-kilometer buried pipeline from the oil fields in Chad to Cameroon’s Atlantic coast, with pumping stations and ancillary facilities, and construction of an offshore marine export terminal facility. Construction of the Chad-Cameroon Pipeline began in 2000, and Chad began oil production in 2003. By 2006, petroleum accounted for 47% of Chad’s real GDP and roughly 71 % of government revenue. In 2008, Chad’s oil revenue accounted for about 80% of Government revenue even though national oil production declined after hitting a peak in 2005. The oil was more difficult to extract than anticipated, requiring additional investment in new oil wells and equipment (Mobbs 2009; Petroleum Intelligence Weekly 2007; FOE 2001). The management of Chad’s oil revenues has been a source of contention between the government and the World Bank, which loaned about $3.6 billion toward the project’s development on the condition that revenues would be used for poverty alleviation. The government used some portion of the revenue to support its military in defense against rebel groups (which were also contesting the misuse of oil revenues) and to secure its eastern border with Sudan (Gentile 2007). In 2008, China’s largest oil producer, China National Petroleum Corp (CNPC), established a joint venture with the government of Chad to build an oil refinery near N’Djamena. In January 2009, China began construction of a 300-kilometer pipeline in southwestern Chad. The pipeline, which is expected to be operational in 2011, will transport crude oil from Koudalwa oil field south of N’Djamena to the oil refinery north of the capital (Straits Times 2009; IDSA 2008). The country also has deposits of uranium, manganese, clay, gold, limestone, salt, and stone. Small-scale mining operations focus on clay, limestone, salt, and sand. In 2008, Chad produced 300,000 metric tons of aggregate, sand and stone, and 10,000 metric tons of salt. Exploration has revealed deposits of gold in the Ouaddai region (eastern-central region) and the southern city of Pala, where the country’s first gold mine is located. Alluvial diamonds have reportedly been found in the Ouaddai region, bauxite reserves in the southwestern part of the country, and titanium in the central region (Mbendi 2001; Mobbs 2009). Small-scale domestic mining operations produced most of the country’s nonfuel minerals. International companies were involved in exploration for and production of crude oil, and exploration for uranium. The majority of non-petroleum resources in Chad have not been exploited. In some cases, the exploration of deposits was inhibited by armed groups clashing in eastern Chad, and by the social instability associated with ongoing military action in the Darfur region of western Sudan (ROC 2003; Mobbs 2009; Same 2008; Mbendi 2001). The Mineral Code (Code Minier) of 1995, Law No. 011/PR/1995, governs Chad’s mineral resources. The Petroleum Revenue Management Law of 1999 (Law No. 001/PR/99 of 1999) and Law No. 002/PR/06 of 2006 govern the allocation of revenue from petroleum reserves. Decree 10-PR-MP-2003 gives a consortium (Esso Exploration, Petronas Carigali, and Chevron Petroleum Chad) exclusive rights to explore liquid hydrocarbons and gas reserves in country (Mobbs 2009; ROC 1995). The Mineral Code provides that minerals are owned by the state. Individuals and entities (registered in Chad) can apply for permits and licenses for exploration and extraction. Exploration permits are generally available for 5-year periods, with two renewals. Exploitation permits have 25-year terms, which are renewable until the deposit is exhausted. Artisanal mining permits are granted for 2-year renewable terms. Foreign companies are eligible to obtain mining rights but must be incorporated in Chad (ROC 1995; Mbendi 2001). The Ministry of Mines and Geology (Ministere des Mines et de la Geologie), formerly the Ministry of Mines and Energy, governs the minerals sector, and the Division of Mines and Geology grants permits and licenses for the exploration and extraction of minerals. The Ministry of Petrol and Energy (Ministère des Petrole et de l’Énergie), formerly the Ministry of Petroleum, has authority over the petroleum sector. The Hydrocarbons Corporation of Chad (Société des Hydrocarbures du Tchad)(SHT) is the national oil company (Mobbs 2009; Mbendi 2001). The Petroleum Revenue Management Law (Law No. 1/PR/99) provides that 80% of petroleum revenue will be used in priority sectors, which include rural development, health and social services, infrastructure development, the environment, and water resources. Chad agreed to use a percentage of its oil revenue to improve agricultural productivity, including diversification of production systems, increased security in livestock farming, diversification of agroforestry, and financial instruments for the rural sector. In the urban sector, the government plans to work on roads, infrastructure and urban services. The government’s adherence to the use of revenue for such development has been questioned (ROC 2003; World Bank 2010). The World Bank supported the US $4 billion, Chad-Cameroon pipeline, operated by Exxon Mobil, by financing a portion of it in 2001 on the condition that profits were spent on programs to reduce poverty. As a component of its support, the World Bank had been assisting the government of Chad to develop transparent systems for the management and allocation of revenue from oil production for use in development and poverty-alleviation. In 2008, the Bank concluded that the government was not directing the revenues as agreed, leading to the Bank’s decision to close its office in Chad. Negotiations with the government in 2009 led to the agreement that future World Bank collaboration with Chad will focus on using the Bank’s existing portfolio, and any new operations, to implement the government’s new 2010–2012 poverty-reduction strategy, and to improve the impact of oil revenues on poverty alleviation (World Bank 2010).